Activ Fun Days are for everyone from your 4-year old child all the way up to your 90-year old grandparents. We offer introductory Archery sessions, fast paced Archery Tag sessions, fun-packed Birthday Parties, crazy Zorb sessions and exciting Challenge Days as well as offering Inflatable Hire. 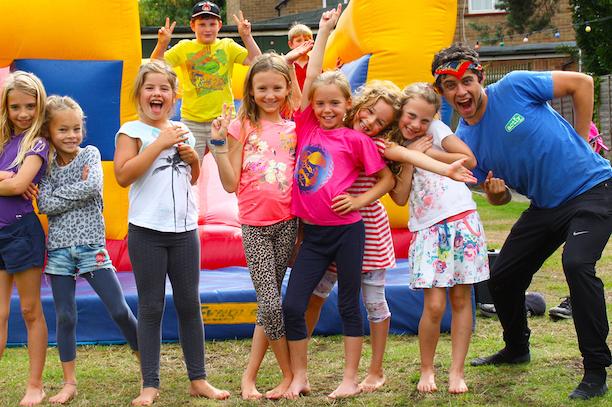 Activ Fun Days are run by fully trained, enthusiastic staff who create a happy and safe environment for children and adults alike. Click on the links above to find out more about what we can offer! Our Activ Fun Days are not just for children, we can run sessions for your stag/hen do’s, your 18th, 21st or 50th birthday or just a university friends get-together. There is no upper age limit, as long as you feel physically able then we can accommodate! So get in touch and see what we can offer! Activ Fun Days have provided inflatables and other sporting activities at the Big Day Out. They are a professional company who have the customer’s need at the heart of their operation. Whatever the request, they have a flexible approach. The staff who have worked on our event are always lively and friendly and they work well with the children. The Furzedown Community network now always use Activ Fun Days as they’ve proven to be a reliable and professional organisation. Highly recommended. Our 9-year old son´s birthday party was organized by the Activ Fun Days team. The staff was amazing and so professional. They came to my home a few days before the party to check that the garden was OK for the epic inflatable! They were really punctual and committed to the children and their needs. Lots of parents have said how much their children enjoyed the party. From start to finish, everything worked really well. The party was great and we would definitely highly recommend them for a children’s party.